Fuchia' lived in a glorious garden, surrounded by her peers, each one alike, yet unique in their own delicate loving way. They all co-habitated together in a peaceful environment, happily conversing daily with each other. No problem was too great, or too small, for they had pledged long ago, that to love one another was the greatest gift bestowed upon them. One particular Morning, as the first rays of light peered quite anxiously through the Midnight hues, Fuchia opened her sleepy, though intensely golden eyes. She saw the worried look upon Dawn's face, and wondered what could be his trouble this morn. There was no unusual signs in the heavens above, no rumbling beneath her sturdy green trunk. For her it was as a trunk, for it made up the most part of her body, though her head was the most dazzling colour array. Dawn continued to widen his yawn, like a chasm opening up, bereft of the usual smile he greeted her and her flowery friends with as a general rule! 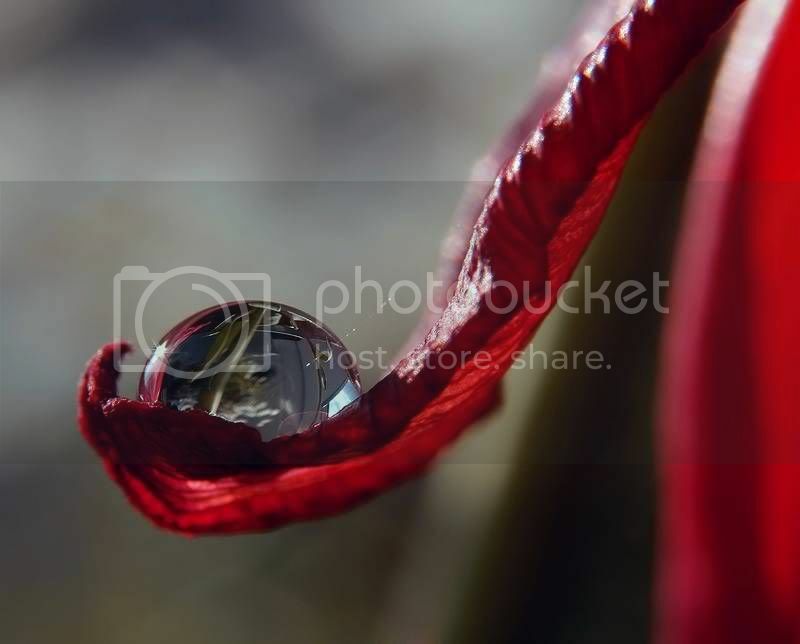 Sensing something quite terrible was about to happen that morning, she decided as a precaution, to hold on to the large dew drop, that was nestled amid her petals. She thought it best to keep him safe, not knowing why. Usually when the Sun came out after Dawn had opened the curtains, Dewy would like to drop down upon the bladed grass below, forming a small pool, with which many others heartily drank. He did this unselfishly each day, and knew how much others depended upon him, breaking the overnight thirst. Fuchia and her friends, glanced at each other, realizing something was amiss, and they too clutched tightly to their precious dew, still no real reason, just a gut feeling. Suddenly the air was permeated with a strange odour, which curiously they recognized. It smelled of one the animals that came to drink, yet, in a more stale commodity. Puzzled yet curious, they all began to peer towards the direction of the smell, until they could see two rather large looking objects. The smell they knew, the shape a complete mystery, and instinctively they knew death was in the air. The creature, tall in stature, yet rather attractive with it's slender trunk, cumbersome leaves resembling more of packed baskets, appeared to have a mane of long black leafy tresses. With a hint of reserve, and thoughts of a foray, this is what Fuchia and her friends figured of the newcomer to their part of the garden. This big garden they lived in, amid taller tree's and smaller shrubs! The stranger had long slender leafy arms, and began to move them systematically about, placing a rather inanimate object upon the ground, just in front of it's face. It's eyes focused intently upon..Fuschia. A sudden Panic flowed through her veins, filling her stamen up and causing shudders right to her core, while dewey, began to get angsty. Shuddering and trembling without control, as her senses went into overdrive, she inadvertently opened her outer petals, realizing the danger she placed dewey in prematurely. He was not yet ready, but this morning, there seemed no choice. Helplessly, after panting hard, trying for dear life to hold onto him for those precious moments longer, his weight bore down her outer petals, and in a nanosecond, he slipped, clean off her protective cover, and began to fall. What seemed like forever for Fuchia, and her amazed friends looking on at the spectacle...he continued down down down,in a motion that was as though a camera, something they knew nothing of, was keeping his ultimate drop, and subsequent splash slower than usual. Then it happened! He hit a blade of grass below, on it's tip before the ground, with the stranger still keenly observing! Instead of making a sploshy impact upon the ground, something strange happened, which they had not seen before, though tales from their forefathers had spoken of this. Dewey split, like he been neatly sliced in two, one half landing in one spot, the other half nearby. Simultaneously, a flash of light penetrated their eyes, blinding them quite nearly for some minutes. As they recovered from the flash, they realized that Dewey was gone, long gone, and the stranger, had vanished from sight, never to be seen again. An important event had taken place that day, though the stranger did not know just how important, let alone how deadly, was the amazing discovery she had made! Documented, photographed, and entrusted to her colleagues in a far off land, long way away from Fuchia and her delicate world. The Fuchia's went on with their lives, each day opening for Dawn, smiling at the sun, allowing their Dews to function as they should, and of course being a most wonderful eye candy to anyone who passed by their way, though they never saw a large plant quite like that one ever again. The following morning, as usual Dawn arose, and woke up the sleeping beauties. His mouth was wide as a yawning chasm, his face in terrible anguish, and his colour, deathly pale, like he himself was on the brink of death. Overcome with the sight, all the Fuchia's dropped their dews, their petals dropped low, and they shuddered and shook, waiting for as it were, some cataclysmic event. An immense blast of light blinded them, as though the entire heavens had unleashed a punishment, that they knew nothing of. Reason and sense left all, and they stood silently still, with bowed heads, petals drooping nearly to the ground, their upright trunks weakening, till they leaned over, nearly touching the earth below. The shock of this sudden immense, bright white light was too much, and they surrendered to it's verocity lying upon the dew laden grass below, feeling their entire beings beginning to shrivel up inside. They suffocated and died, right there amid the terror stricken tall tree's who were suffering with scorching, some afire, yet the sun had not even graced them with his presence. What had happened? What had destroyed the peace, the beauty, the tranquility of their world! Those who remained asked the question, and enquired amongst the tree's who had survived, speaking in hushed tones for fear of another onslaught. Dawn was never the same to them, and each morning they needed reassurance from generation to generation, as the story was handed down to each new plant and it's seed in turn. All Mother Nature spoke of this, and to this day it has never left the lips of all plants in gardens everywhere, especially where Fuschia lived, for they were the one's who felt the worst impact. They knew they never wanted to see such a terrible light again, or feel the overpowering illness that followed. As time went on, stories of such an event filtered back to the Fuschia Garden, that other notable plants and creatures in other far away places had suffered the same fate. Nature had lost something, and this loss it seemed was forever! As for Dew drop, he never lost that feeling of guilt, and forever blamed the catastrophe upon himself...though he was indeed as innocent as the Morning Dew! !